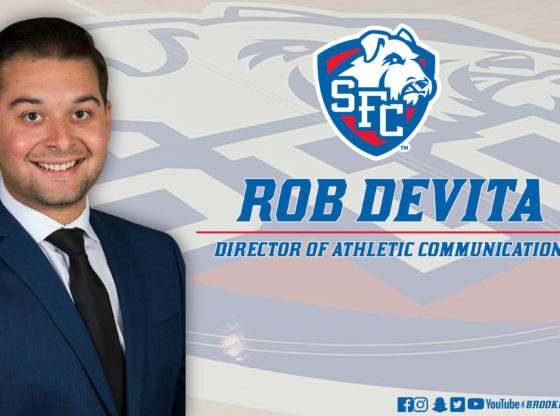 St. Francis College (SFC) has recently announced that Rob Devita will take over as the Director of Athletic Communications. The 2015 Terrier graduate will be overseeing all media relations through athletics. This includes coordinating interviews, broadcasting games, making graphics and videos showing off the talent of our Terrier athletes and sending out a great message about our programs. He will also be in charge of overseeing the student-operated social media accounts for all of the teams at the college. While attending SFC, Devita was a communications major and a member of SFC Today. He credits Mark McSherry as being his mentor when his passion was journalism. Prior to being hired at SFC, Devita worked for many different organizations including the New York Mets, New York Rangers, and the Metro Atlantic Athletic Conference (MAAC). While working for the New York Rangers in public relations he became interested in highlighting the company and making them look as good as possible. Devita says he is extremely fortunate and blessed for all the opportunities he has been given and attributes the time he spent at SFC for his success. He is a firm believer that it does not matter where you come from or what school you attend, but as long as you have determination and passion, you can reach your dreams just as he has.